Due to annual leave the company is closed from July 17th, 2017- July 30th, 2017. Due to public holidays the company is closed from July 5th, 2017- July 9th, 2017. Our company will be closed from July 18th, 2016- July 31st, 2016 due to summer shutdown. Enjoy the rest of this summer. Our company holiday is performed from July 20th, 2015- July 31st, 2015. Enjoy a fine rest of this summer. Annual leave provided within July 19th- August 3rd, 2014. We would like to inform you that during this time the power will be off due to extraordinary maintainance.Thank you for your understanding and enjoy the rest of the summer. Providing a modernization of 26 Bdt279 passenger coaches for Ceske drahy produced within 1986- 1987 in Vagonka Studenka. Company Krnovské opravny a strojírny s.r.o. was qualified for wheelset repairs in the grade IS3. Many thanks to all our customers and business partners for confidence in passed year. Krnovske opravny a strojirny s.r.o are closed at Christmas time from 24.12.2012 to 6.1.2013. Invitation to InnoTrans 2012 in Berlin. An annual closure of Krnovske opravny a strojirny s.r.o. is planned from 16.7.2012 to 27.7.2012. Krnovske opravny a strojirny s.r.o. invites all business partners and rail vehicles friends for Czech Raildays 2012 exhibition. Krnovske opravny a strojirny s.r.o. handed over reconstructed historical trolley no. 25 to its owner Brno´s Technicke muzeum 20.3.2012. Krnovske opravny a strojirny s.r.o. have finished production of two trams VarioLF for the capital of Uzbekistan Tashkent, which was despatched from Krnov´s plant on Monday, 13.2.2012. WISH YOU REALLY HAPPY NEW YEAR 2011!!!! 8.11.2010 - The prestige ACRI (Association of the Czech Railway Industry) Awards which are the significant awards of companies in railway industry, were awarded at the international exhibition InnoTrans 2010 in Berlin by the end of September. 15.9. 2010 - We would like to invite you to visit us at the international exhibition InnoTrans 2010 which will be held in Berlin from Sept. 21st, - Sept. 24th, 2010. You can find us in hall 5.2, stand 208. 14.6.2010 - 11th international fair trade of the railway technology, products and services for the rail and city transport Czech Raildays 2010. 17.3.2010 - Krnovské opravny a strojírny s.r.o. participated in presentation of revilatizated express trains at Masaryk Railway Station in Prague on March 16th, 2010 at attendance of Czech Railways leaders and repair service representatives. 8.2.2010 - Company Krnovské opravny a strojírny s.r.o. has launched a complex project in 2009 aimed at sequent implementation of improvement system known as 5S resulting from phylosophy of LEAN Manufacturing. WISH YOU MERRY CHRISTMAS AND PROSPEROUS AND HAPPY NEW YEAR 2010. 4.12.2009 - Company Krnovské opravny a strojírny s.r.o. is a subsupplier of transport equipment intended for burnt fuel removal from reactor in the 3rd block of nuclear power plant FA3 in Flamanville France. 25.11.2009 - Our company participates in implementation of production prototype four-axle traction unit prototype based on the order of ARROW LINE a.s.
18.8.2009 - Our company has declared its positive relation to environment by sponsorship of town Krnov in preparation to international competion "Entente Florale Europe 2009". 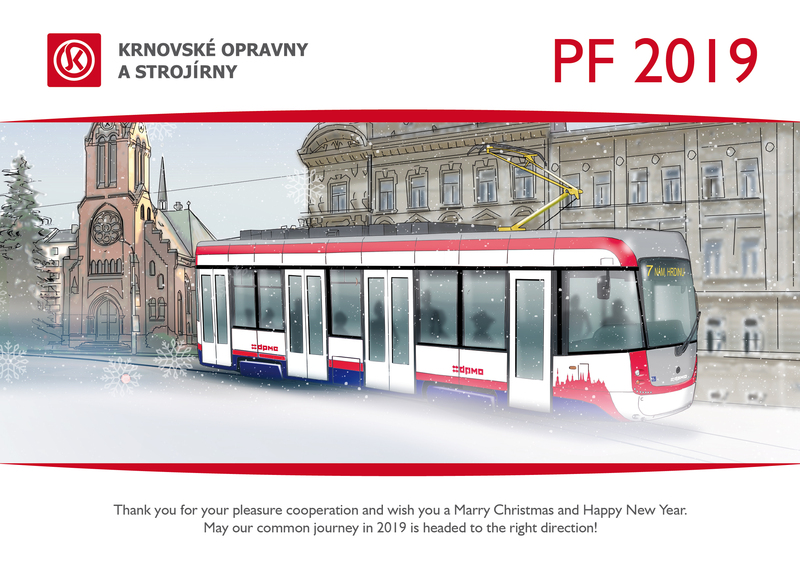 12.6.2009 - After 10 month of hard work we have renovated a historic landmark of Czech Republic for DP Olomouc- two-axle motor tramway produced in Ringhofferovy zavody Praha in 1930. 14.5.2009 - Shipment of the first low floor tramway VarioLF to Moskow. Final assembly according to our project will be provided by Moscow transportation company Mosgortrans. 1.4.2009 - The company Krnovské opravny a strojírny s.r.o. has a new modified logo. 23.3.2009 - Krnovské opravny a strojírny managed to solve long-term problem of wheels shortage for narrow-track wagons. 4.2.2009 - Our Web sites are running. We believe that you enjoy our new design and you will be orientated well in our products based on the transparent Web sites structure.